Die Kits bestehen aus einem speziell gefertigten Material aus der Raumfahrttechnik. Die Folie ist auf dem Rahmen nahezu unsichtbar. Um diese auf diesem Foto sichtbar zu machen, mussten wir das Bild mit Photoshop bearbeiten. Jedes Set wird mit einer detailierten Anweisung geliefert, wo das Kit zu platzieren ist. Das Material ist von Natur aus elastisch. Der Plotter schneidet ein weiteres Kit aus. Die Einzelteile müssen vor dem Aufbringen eingeweicht werden. Am einfachsten ist die Montage auf einem zerlegten Rahmen - hier bringen wir die Schutzfolie auf ein weiteres Testbike auf. Es ist einfach die Luftblasen heraus zu reiben. Wir habe die Sättigung auf dem Bild stark herunter gedreht, um das Kit auf unserem Testbike sichtbar zu machen. Das Kit ist genau an die Schweißlinien des jeweiligen Bike-Modells angepasst. Es gibt keine Blasen - oder Faltenbildung auf dem Material. Der Unterrohrschutz hat uns sehr gut gefallen, dieser sieht toll aus. Wir mussten erstmal Mut finden, um diesen Härte-Test durchzuführen. Wir haben die Klarheit in Photoshop erhöht und dennoch ist der Kratzer nicht zu sehen. Wir haben den Kratzer einfach weggerieben. Mit bloßem Auge kann man den Kratzer nicht sehen.Obwohl wir das Bild mit Photoshop bearbeitet haben ist dieser fast unsichtbar. The cost of all E-Bikes that we test and most E-Bikes that are owned by people who read eMTB-News is, lets be honest, pretty high. Most of our preferred rides come in at the 4500-6000 € mark. 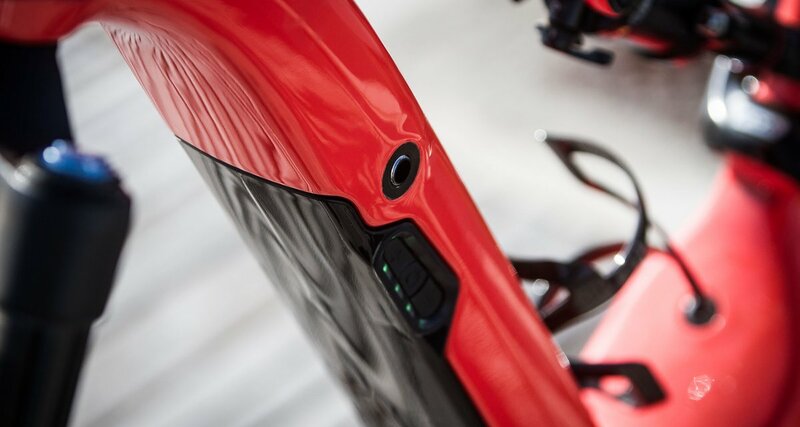 One of the key features we look at is the overall finish of an E-Bike. So when after a hard ride we get back home and discover stone chips, dirt scratches and even shuttle rub, we are almost always disappointed. Chameleon Skin is a start up solution that we have followed for the last year that goes along way to removing this problem. Essentially it is a complete self healing frame wrap for your E-Bike. Brilliant Idea – Invisible and protects our expensive bikes. Chameleon Skin installs onto the frame with warm water, and covers all the major and minor parts of the frame. The kits have been designed and exist for almost all frame types in all sizes on all E-Bikes. The material resists rub, stone chips, reduces impact damage and is self healing. Once the user decides to remove the material, the E-Bike will look new. Available in gloss or matt finishes it’s hard/impossible to actually see on the E-Bike, therefore preserving the original finish and look. We tested this material on a number of E-Bikes and discovered that it is a zero maintenance product. Even after washing the frame the stickers stay stuck, but leave no residue when removed. We tend to be quite hard on E-Bikes paint, so for us it is a zero sum game to install it. Costing only 120 € for a kit (they are quite complicated to design) considering the end result makes sense. # They are invisible on the frame, to see them in this photo we had to turn up the clarity in photoshop. Essentially the frame wrapping material is a space age film that is used on formula one cars, super sports cars and many other items that experience high impact risk from small flying debris. It is self healing in nature, this means that small scratches will simply rub out of the material. Can be installed by anyone with patience and does not use glue. Installation with soapy water, removal with a hairdryer. light weight less than 1 mm thick. Covers all high risk areas of rub/damage on the frame. Kits Price range between 90 and 120 € depending on complication level. Custom graphics coming in the future. # Each kit comes with instructions and details where to place the kit. # The material is elastic in nature. # The plotter cuts out another kit. Installation of the average kit takes about 1-2 hours if your bike is clean. The key point is to do it before you ride your new E-Bike, bike shops exist that also specialize in the kit installation. Using a water solution with a touch of soap, the elements are laid out on the frame and rubbed down. we found that there were virtually no air bubbles, a small squeegee can be used to remove any. Whilst the material is wet it can be lifted and repositioned. # Soak the pieces for installation. # Install on a stripped frame is easiest - here we are shown on another test bike. # Rubbing out the air is easy. The Chameleon Skin kits have been in existence for a few years, with some bike makers using them on their race team bikes, including Trek XC and also quite a few rental fleets have been the target of these kits around Italy. The experience of all has been that they work and are hassle free. We were hard pressed to actually see the kits on the bikes and with the photos we have taken we had to “photoshop,” the colours a bit to actually show you the seam lines as they are almost invisible. If the bike has weld lines or other features, the kits take this into account and match perfectly to any weld lines. # We turned down the saturation in order to try and "see" the kit on our test bike. # Every part is covered. # Here the kit matches the frame weld lines. # Can you see it? # No crinkles or folds on the material. # We really liked the downtube protection, looks great. We decided to see how protective the kits are and took our TORX 25 key and dragged it down the top tube of our test bike with some pressure that would normally leave a horrible scratch. After rubbing it briefly you can see the damage rubs away to almost nothing. It’s really hard to discover it. # We had to find courage to do this! # We turned up the clarity in photoshop, and you can just see the scratch. # We gave it a rub. # To the naked eye, you cant see the scratch, despite with clarity turned up in photoshop, its almost invisible. We had been given a very shiny test E-Bike to carry out a product test on for this product which, to be honest, is very expensive and beautiful to look at. After a lot of trail riding and bashing over rocks the bike looks perfect still. We particularly liked the downtube protection element. Which in this case fits over the battery. It looks good and really stopped any scratching or rub damage. Even after a dusty run, the edges of the material come clean when washed, leaving the material looking invisible and a frame in almost showroom condition. In a few months we will pull the kit off our test bike and update this article to give an idea of our actual experience. Chameleon Skin does work pretty well. We were shown a range of bikes over time that it had been used on that looked essentially new. In a very short time Chameleon Skin kits have become really popular with all types of bikers. New kits are being added all the time and they will also make kits to order if they don't have it already. Some frame manufacturers will be issuing these kits as optional extras. A simple idea with the right material that seems to work. Protects the frame from most trail damage for a long time. Each kit is made for your bike. Take patience and a steady hand to install. Is there a way to make scratch resistant paint? Photography: Alex Boyce, The American, Chameleon Skin. The cost of all E-Bikes that we test and most E-Bikes that are owned by people who read emtbNEWS is, lets be honest, pretty high. Most of our preferred rides come in at the 4500-6000 € mark. One of the key features we look at is the overall finish of an E-Bike. So when after a hard ride we get back home and discover stone chips, dirt scratches and even shuttle rub, we are almost always disappointed. Chameleon Skin is a start up solution that we have followed for the last year that goes along way to removing this problem. Essentially it is a complete self healing frame wrap for your E-Bike.